7 Kids and Us: LeapFrog LeapPad2 Power Learning Tablet just $64!!! LeapFrog LeapPad2 Power Learning Tablet just $64!!! This LeapFrog LeapPad2 Power Learning Tablet is just $64 + free super saver shipping! Includes a Disney Junior Doc McStuffins themed LeapPad2 Power Learning Tablet with 4GB of memory, front and back cameras and video recorders and more! Included Recharger Pack keeps LeapPad2 Power charged for up to 9 hours of learning-packed fun. 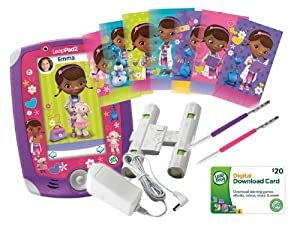 Also includes a $20 Digital Download Card, 8 Doc McStuffins Wallpapers, 2 Extra Stylus and 9 included Apps (onboard and downloadable). Works with LeapFrog's educator-approved library of 800+ apps, games, eBooks, videos, music and more. Recommend for ages 3-9 years. Comes in Amazon Certified Frustration-Free Packaging.